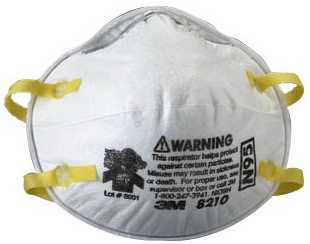 3M 8210 N95 Respirators Dust Masks Case of 160. N95 NIOSH approved particulate respirators. Popular 3M brand. Lightweight construction includes an adjustable aluminum nosepiece and foam seal to reduce the potential for eyewear fogging. Ideal for general industrial applications. Not recommended for asbestos or sandblasting. Round masks fits over mouth and nose. Two durable, latex-free headstraps. Compliant with 42 CFR Part 84. Provides a minimum of 95% filter efficiency against certain solid and non-oil based particles for excellent worker protection. They can be used in labs, for painting, for doing household projects, and for general protection against respiratory viruses. 20 pieces per box, 8 boxes per case for total of 160 masks per case.